I was just going to post an excerpt and then link to this article by a queer person of cover Lian Low at Peril Magazine it is too good and says something too important to simply cut out half. It needs to be read in full. The first time I met Fear of a Brown Planet comic duo Aamer Rahman and Nazeem Hussain, it was not at a post-show groupie hangout; it was at the very edge of the performance stage of an overcrowded Espy where we were all moshed in together to watch one of the legends of hip-hop – Public Enemy. I stole a half hour from Fear of a Brown Planet’s busy schedule earlier this year just after the final show of their sold-out season at the Melbourne International Comedy Festival in April. “Why do you always do political comedy, Aamer?”, asked one of his friends, “watching you is like watching the news”. Despite the gibes about being “too political”, Aamer believes that it’s “possible to be angry and funny at the same time”. “For us it’s always gone hand in hand. [This has] always been the type of comedy that we really enjoy. We’ve grown up on a lot of comedians like Chris Rock or Richard Pryor or Bill Hicks. Those artists have always used comedy as a political vehicle not as a gimmick or anything like that”. Aamer and Nazeem are in a rare breed of comedians who are fiercely proactive when it comes to social justice and community. They are often at rallies and support community gigs that are engaged with social justice. “We have an idea of what the world should be like or what society should be like. You know like racism shouldn’t exist, or racist violence shouldn’t exist,” states Aamer matter-of-factly. “A lot of what we talk about is just a lot of what other communities are talking about. These are issues that aren’t joked about, but I guess to see from our perspective it’s really about phrasing it and unpacking it in a way that is easy to understand,” Nazeem explains. Both university law graduates, Aamer and Nazeem didn’t aspire to be comedians but somehow found themselves in comedy. According to Nazeem, they met whilst working on a youth project together. In fact, it was working with young people which got their comedy juices flowing. “To engage young people you have to be always interesting and funny, otherwise they switch off,” reflects Nazeem. A significant turning point in their initiation to stand-up was meeting a trio of US based Muslim comics called Allah Made Me Funny, one of the first Muslim stand-up troupe to tour about being Muslim in a non-Muslim society. Nazeem’s response was akin to love at first sight. “I actually memorised all the lines. I memorised word for word the entire show before they came here. I was that obsessed with them,” he gushes. Allah Made Me Funny took the duo under their wings and from there they decided to enter Triple J’s Raw Comedy competition, where both reached the Victorian finals. Aamer trumped the finals and scored the runner-up position Australia-wide. 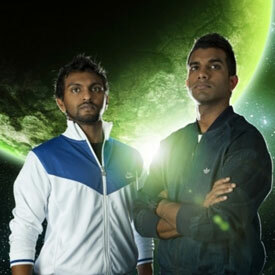 Now with mass critical acclaim, sold-out seasons and awards under their belts (including Melbourne International Comedy Festival Best Newcomer Award 2008), the duo shared the spotlight with Allah Made Me Funny in October 2010. Arguably the most radical element of Salam Café was Nazeem’s character called Uncle Sam (aka Uncle Sameer Iqbal Muhammad Salahhudeen) who plays on media-driven fears about Muslims “taking over”. As Uncle Sam, Nazeem tackled issues such as the dispute surrounding the building of a private Islamic school in Camden, in Sydney’s West. Uncle Sam also managed to gain airtime with Andrew Denton on Enough Rope in which he outwits an unusually stymied Denton in banter about Australian identity and racism. Perhaps the most outrageous skit for Uncle Sam was a visit to Frankston, where during the filming of the scene, Nazeem and his camera man, a Lebanese man named Jihad, were surrounded by forty screaming and swearing people who threw bottles whilst attempting to grab the camera and rip Nazeem’s beard. “It got to the point where I had to say, “Listen, everyone, just shut up – we’re here to make fun of Muslims too!” And everyone went “Yeah!! !” And then we ran. Seriously, we would have been killed. It was ridiculous.” For the Salam Café episode of this series (which you can see on Youtube), the more confronting incidences were left on the editing room floor. Not surprisingly, Aamer and Nazeem’s experiences on Salam Café help fuel their critique about the absence of people of colour on Australian television. “Australian TV is very white,”says Nazeem exasperatedly. “To the point where it’s been criticised overseas. In the UK there was a poll; Home and Away and Neighbours were criticised for being too offensively white,” Aamer recounts. “It’s just ridiculous! In the UK, they understand Australia more than we seem to. How could a suburb be that white? They don’t even have the token brown cleaners!” exclaims Nazeem. When they are not working on their comedy, Aamer and Nazeem can be found at Footscray Community Arts Centre producing events as part of their three year artists-in-residency contract. The duo were headhunted to produce a joint VicHealth and Footscray Community Arts Centre funded program about discrimination in the western suburbs. One of the events of the program was a series of free hip-hop workshops called Hip-Hop Academy. Young people in the Academy can take on breakdancing, mixing, rapping and grafitti. I swung by a couple of workshops and tried out the breakdancing with B-boy Lamaroc and rhyme-writing with musican and producer Pataphysics. The kids at the Saturday workshops ranged from aged five upwards. It was touching to see so many young people of colour in one space giving everything a go. I remember seeing two 14 year-old Polynesian girls hovering outside the rhyme-writing workshop. When I left, through a little coaxing, Pataphysics had them sitting down penning their first raps about culture and identity. The other part of Fear of a Brown Planet’s residency included a series of online vox-pops and critical montages of current political events. One of their videos was about the controversy surrounding the black-face skit on Hey, Hey It’s Saturday. Unlike mainstream commentators, Fear of a Brown Planet interviewed people of colour on the street to hear their opinions about the issue. “Because The Chaser did it [black-face] and because no one said anything, it just went on air and it just wasn’t an issue,” says a disgusted Nazeem. “It was equally as offensive as the Hey, Hey sketch. Just because The Chaser are political and they appeal to white liberals no-one took them up on it,” adds Aamer. “It doesn’t discount the fact that it’s highly offensive just because it’s five privileged white guys doing black-face. And just because the song was political – it was about the ALP and the Liberal party – somehow it gave them a pass; but it was just as offensive. Even when it was an issue on Hey, Hey, the only people that seemed to discuss the issue were panels of white people discussing whether or not this was offensive to other people. Some of them would say ‘yes, it was absolutely offensive’. You just never get to see from black or brown people about the issue,” Aamer says disgruntled. In a country where debates about racism have been watered down or silenced, it’s exciting to see two young brown men fighting for social change in a creative and powerful way.